Fast Waters - Steep Rocks & Brilliant Fun! Canyoning is definitely one of the most outrageous activities you can do on your stag do. You’ll be scrambling up rocks, swimming across pools, sliding down chutes and jumping off cliffs and guess what you are not in a mad scene from Indiana Jones but you will feel like it. Do expect to get wet and once you start, your adrenalin just throws you through the whole days activities with the big smile, you will love it. This is a great opportunity for you also to get a glimpse of the natural beauty of Scotland in all its splendour. 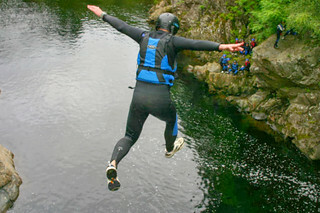 If extreme adventure is what you need, we can organise canyoning and cliff jumping for your group at Aberfeldy. We have a number of sites where we offer Canyoning but all are about an hour and 20 minutes to get there from Edinburgh. We can arrange transport for you to get up there if you have flown or got the train into Edinburgh. Canyoning runs from May to the end of September, you’ll be supplied with all the equipment required to make it a safe and fun adventure, and adventure is the word. COME ON. Just try this, it is mind blowing, not many other activities touch the same note for a great weekend. Make sure the guys who ware glasses will need to put their contact lenses in (the throw away type). Really enjoyed canyonning never done anything like it before, highly recommend doing it if you’ve never done it before. The mental bit was the finial cliff jump which was 30 feet, felt like 90!!!! Thanks for a great weekend! - Steve.